Apple identified a Taptic Engine defect affecting the Apple Watch before shipping the device to any customers, according to Re/code. The report, citing people with knowledge of the matter, claims that no faulty Apple Watches reached customers, and reiterates that Apple has shifted the majority of production to Japanese supplier Nidec, which has not encountered the same issue. The Wall Street Journal reported on Wednesday that Apple discovered Taptic Engines supplied by AAC Technologies Holdings in Shenzhen, China would break over time, likely contributing to current Apple Watch supply constraints. 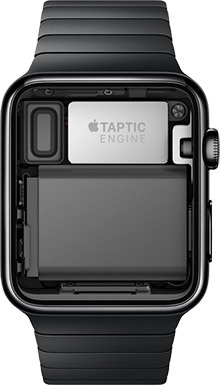 The Taptic Engine, which creates creates motion in a straight line by moving a small rod, powers the haptic feedback capabilities of the Apple Watch by alerting users about incoming messages or notifications with gentle taps on the wrist. Apple Watch pre-order deliveries began on April 24 in the United States, Australia, Canada, China, France, Germany, Hong Kong, Japan and the United Kingdom, although many customers are still waiting to receive their devices. A portion of customers with initial shipping estimates of 4-6 weeks or later have received their Apple Watches sooner than expected, but there remains several orders that have yet to be fulfilled, particularly some Space Gray and Space Black models. 1. That has nothing to do with the current issue. 2. NO product, I repeat NO product, will be perfect, no matter how much testing is done. If you expect that, you need to be living on a different planet. Sheesh! 1: I was responding to someone else's claim that Apple's quality control cannot miss a product fault. 2: I wasn't claiming that there are perfect products, but one would think that the biggest selling point of the Retina iMac, the screen should at least be perfect. Don't make excuses for Apple, I repeat, don't make excuses for Apple! There are no faulty watches. This is good news! I am getting mine later today! Nobody should be surprised. Apple has meticulous QA that always prevents faults like this from reaching consumers. This is another reason why I love Apple. They always put product perfection ahead of shipping x number of units to meet initial demand. Yes there may be shortages for the time being, but the assurance you are getting a world class product should make those delays more palatable. No Apple Watches Were Shipped to Customers. Hmm...John Gruber reported in his original Apple Watch review that he had a faulty Taptic Engine. "No faulty watches were shipped to customers". Clearly, John Gruber was not a customer. That said, if the watch has some benefit to you, this is a palatable story regarding delay. They are taking the time to try and ensure they get this one right. Other companies change their products so often, they will never ship anything that isn't Rev A. This is why I don't by Gen. 1 products. They always put product perfection ahead of shipping x number of units to meet initial demand. Yes there may be shortages for the time being, but the assurance you are getting a world class product should make those delays more palatable. world class product? I'm picking myself up from the floor after falling backwards laughing. Great products, premium price, but what about bothering to test them before boxing them up and shipping them out? If this watch was a $59.95 cheapie, yeah sure, but I would have expected that paying $579 Australian for a 42mm SG BSB watch would see somebody at the factory end test them before packing and sending them. Received a faulty Apple watch yesterday, a week prior a friend of mine in Melbourne had exactly the same experience. Anybody who believes Apple has awesome quality control is deluding themselves.